The evolving trend of Smart Cities is one that governments should be wholeheartedly embracing, but as with many government initiatives, seems to be having a hard time getting off the ground. Embedding crowdsourcing and innovation management into the Smart Cities initiative could be what makes the difference. At first glance, the term “smart government” appears to be oxymoronic. And no further explanation is needed. However, on a closer glance, when you read about and think about the deep changes business and industries have gone through, including digital transformation, you look back at the governments and think, “Aren’t they stuck? No wonder nothing much is achieved!” And when you look at the way things are progressing: from smart phones to smart watches to smart cars, smart offices, smart cities, etc., the natural evolution of the course should be smart, or digital, government that not only enables more efficient engagement between its personnel but also upgraded contact with the people, including value-generating services. 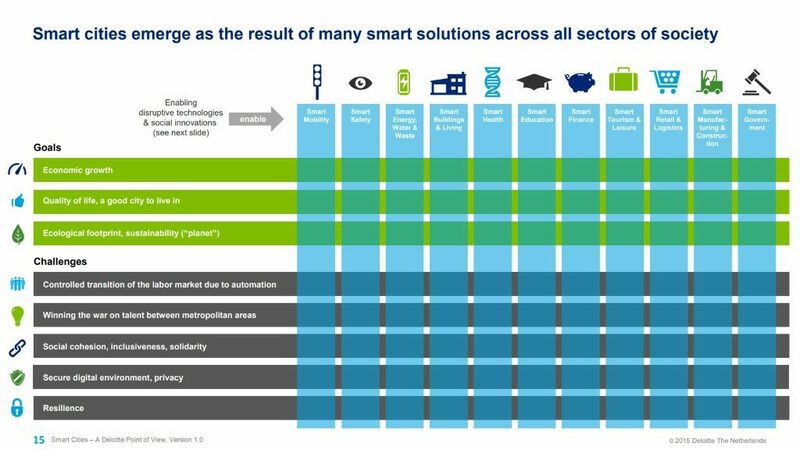 Is Your City Becoming Smarter? In recent years, thanks in large to the Internet and proliferation of mobile devices, people have become accustomed to receive instant customer service. It logically follows that local administrations and governments should follow suit. Cities such as around the world are all adapting technological and digital tools to optimize services and the city infrastructure. In Amsterdam, for example, over 500,000 households are connected to smart meters. These digital gas and electric meters automatically send consumption information to the utilities provider. This also allows users to see their exact consumption and what steps they can take to save energy. In Barcelona, the transport tickets are embedded with chips which pass along data on public transportation times and usage, which can be used to make the system more efficient as well as keep commuters informed on travel times. Copenhagen’s smart city ambitions aim to harness technology and digital tools to make the city greener, healthier and attract more businesses. While these are an auspicious start to the Smart City trend, they are still the outlier, and not indicative of most cities. Taking a page from cities around the world who are adapting advanced technologies and digital tools to systematically upgrade the infrastructure and quality of life for the citizens, the government needs to adapt a similar approach to make its branches more accessible while more effective in its handling of statewide affairs. The most obvious example would be natural-disaster prone cities and states, where technologies can be used to prepare these places well in advance, as well as try and reduce potential damages as much as possible. Digital transformation has enabled direct, practically instant communication with citizens. Harnessing this ability has enabled local governments that have gone through the digital transformation process to keep up with citizen demands and provide instant feedback and support to citizen requirements. Even the cities that have embraced digital transformation, however, are lagging behind the private sector. It’s no secret that most of the tech innovation and digital disruption takes place in the private sector. It’s also no secret that digitally mature organizations tend to rate much higher with customers than those who are still in the middle or start of the process, to say nothing of not digitally transforming at all. In order to become “smart”, governments need to “import” talents, ideas and innovations from that world and adapt them to the somber-looking world of clerks and seemingly never-ending cycle of bureaucracy. Because digital and technological transformation cut more deeply than a simple website or social media “paint job,” as it were, external innovators from the private sectors must be involved from the start. Like all good things, everything starts with a strategy to implement the digital transformation and its core attributes – culture, leadership, staff, accompanied with a way to track and measure the department/body’s goals. As a part of the launch of the initiative, as many different players and internal stakeholders should be engaged, establishing sustainable collaboration from within the government. Once the internal component of the program has been launched and is running smoothly, it is time to complete the second stage of the rollout, engaging external stakeholders as well, from all sectors of the economy. One can and should only take a hard look at the drought in South Africa, where the embracement of technological solutions from external sources could have greatly alleviated, if not prevented, the water catastrophe. Shortsighted water management strategy, coupled with the resistance for collaboration with external groups to implement solutions such as desalination, helped dig South Africa into the serious drought hole in which it found itself. It’s been proven that companies with consumer-centric digital solutions have made the digital transformation far more successfully than companies that didn’t. While until now “government” and “quality, customer-centric” service seemed like a difficult combination, technology and digital transformation does make connecting with people easier. The question is, how can the government implement digital solutions to cater its citizens in the best possible manner? 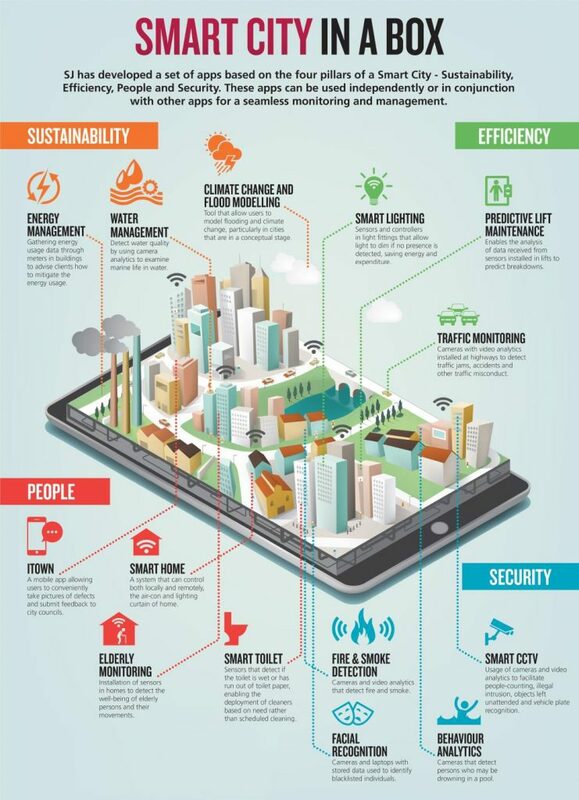 Stratafy embodies smart cities and smart buildings and everything you see in the image to the left we help drive within the eco-system.